I haven't done a glitter combo post on here for a while but last night I decided to try out two of my new glitter polishes and a new addition to my ever growing collection of lilacs. I bought the Barry M Gelly Hi-Shine Nail Polish in Prickly Pear a few days ago from Boots. Its part of a recent Barry M launch of Gel inspired nail polishes, Although to be honest I don't think it was that special compared to their regular line of polishes although depending on how it wears I might have a better opinion on it. I was mainly drawn the colour though, it's a beautiful subdued greyish lilac. Similar to my favourite Models Own Utopia but a lot more purple. Layered up with American Apparel Constellation which I got for free when they had a freebie deal on towards the end of last week. It's a clear glitter with holographic tinsel which is lovely and a unique glitter within my collection. I then layered over another new glitter to my collection Models Own Blizzard, which was from the Wonderland collection. Somehow the wonderland collection passed me by and I only grabbed a set a few weeks ago. However obviously a collection of glitters had me sold! Blizzard is a clear glitter with various sized holographic glitters in. 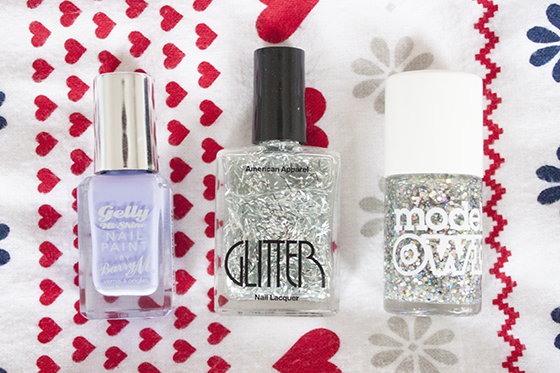 I love these three sandwiched together for the ultimate princess nails look! I really need to lay off the girly glitters, but I just can't help myself! Tackiness to the max!